In Jamestown, New York, horse drawn street railway operation began in 1884 which represented a dramatic improvement in traveling over rough and muddy city streets. With the coming of the electric trolley car, travel speeds doubled from 5 to 10 miles per hour. 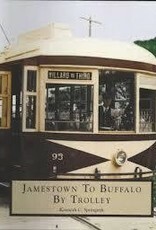 Horse cars were rapidly phased out, and soon Jamestown had trolley car lines stretching west to Westfiled, New York and south to Warren, Pennsylvania. 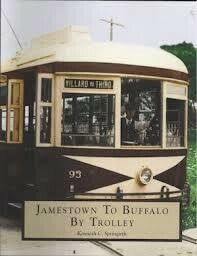 Jamestown to Buffalo by Trolley features many vintage photographs documenting the history of trolley lines that linked Jamestown to Westfiled where connection could be made with the Buffalo and Lake Erie Traction Company east to Buffalo, New York and west to Erie, Pennsylvania.